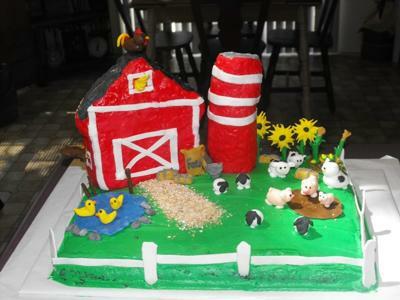 I made this barn yard cake for my cousins 1st birthday party. It was a real hit everyone loved it. I used an 11X15 cake pan and made a chocolate cake with a chocolate mousse filling along with buttercream icing. I made the barn using the Wilton's house pan and made it out of rice crispies. I also made the silo out of rice crispies as well and had to form this into the shape. I made the horse head sticking out of the side of the barn out of fondant and attached a toothpick into it, so I could attach it to the barn. I also did the same for the rooster so that I could easily attach it. I also made the ducks, cattails, rocks and the pond out of fondant. The pigs and the mud were made out of fondant as well along with the cows and sheep. The rest of the items corn stalks, corn, bucket, straw bales, bucket, feed sacks, corn with basket and fence were made out fondant. For the sunflowers, I placed toothpicks at the end of the stems so that I could place them into the cake. I used ground up granola cereal to make the dirt road from the barn. I spent a lot of time on detailing the farm animals and the other items.